For the first time, the US Food and Drug Administration (FDA) has approved medication to treat children with a serious infection called Chagas disease, which stealthily infects and damages the hearts of millions of victims a year. Chagas disease is caused by the parasite Trypanosoma cruzi and spread by the triatomine bug, also called a "kissing bug" because it prefers to crawl near the face or neck of its sleeping victims. They're most active from dusk to dawn, according to Rachel Curtis-Robles, a researcher at Texas A&M University. The bug creeps in or out of cracks in walls and windows, and bites its victim, then defecates after feeding. Victims itch the bite area, often in their sleep, rubbing the feces into the open bite — transmitting the parasite into their body. For many, initial symptoms are mild or non-existent. They're not specific to Chagas, either, they include fever, fatigue, body aches, headache, rash, loss of appetite, diarrhea, and vomiting. The tragedy of Chagas disease comes later in life. If not treated early, it becomes chronic and can fester in the body, often for decades, and cause irreversible and severe, if not fatal, cardiac or gastrointestinal damage by burrowing into body tissue. In the header image above, the parasite is living in the tissue of the heart muscle. There's no treatment for chronic Chagas disease yet, doctors can only try to manage the symptoms, but if detected and treated early, medication can cure it. "We receive dozens of inquiries to our Citizen Science Program each year about kissing bugs found in bedrooms, some of which are children's bedrooms," Curtis-Robles told Invisiverse. "We work closely with state health departments and the CDC to get the bugs tested, which guides physician's actions in cases where the bug may have had contact with a person." The World Health Organization estimates up to seven million people have a T. cruzi infection. In the US, the numbers of infected range from 300,000 to over one million people. In a press release, the FDA notes the disease primarily affects individuals living in rural Latin America. 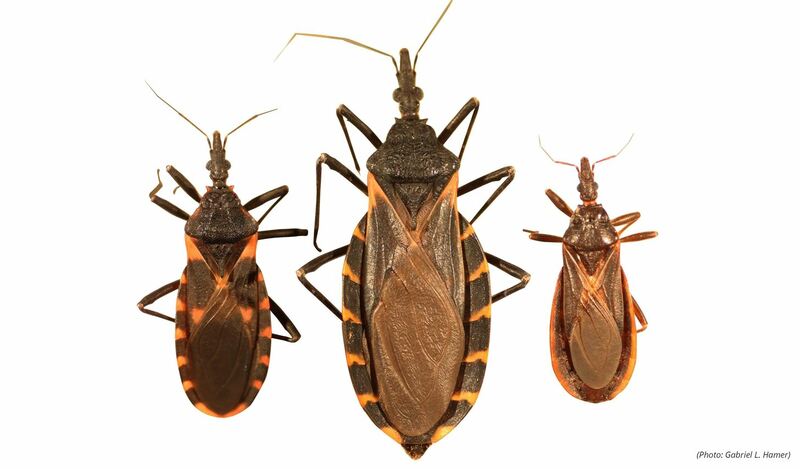 Triatoma bugs, which carry the parasite, are also endemic to the southern half of the US, and Chagas disease occurs in this country in southern rural regions where housing is substandard, or in remote cabins or recreational areas frequented by humans and wildlife. The FDA approved the new treatment (benznidazole) specifically to treat children between two and 12 years old. Its approval was fast-tracked by the FDA under the Accelerated Approval program, which is intended for compounds with a "positive therapeutic effect" to fill medical needs. In the past, the drugs benznidazole and oral nifurtimox have only been available from the CDC for treatment of Chagas disease upon physician request. Approval of benznidazole came after two placebo-controlled clinical trials effectively and safely treated 60% of patients between the ages of six and 12 years of age. In the trials, the researchers considered the drug a success if a formerly positive antibody test changed to negative, meaning the body was no longer fighting off the infection. An additional study provided information on the metabolism of benznidazole in the human body, providing dosing information for patients as young as two years of age. Rapid treatment for suspected exposure to Trypanosoma cruzi is critical. If you find a kissing bug in your or your child's bedroom, get tested for the parasite. Adults or parents of children suspected of exposure to kissing bugs should seek advice from their physician as soon as possible. Since the FDA only approved the drug for use in children, adults with an acute Chagas infection will still need to seek a physician's' request for medication from the CDC. Approval of benznidazole by the FDA for young Chagas patients will increase access to effective treatment and hopefully reduce the likelihood of chronic illness and shortened lifespan that is the destiny of those diagnosed with Chagas.